NVIDIA (NVDA) shares have been trading sidewys for the last two months, and that’s a good thing. The stock was able to put a halt to the brutal >50% decline off its October high. Since mid-November it has been vascillating around the 50% retracement level of its histroric range. 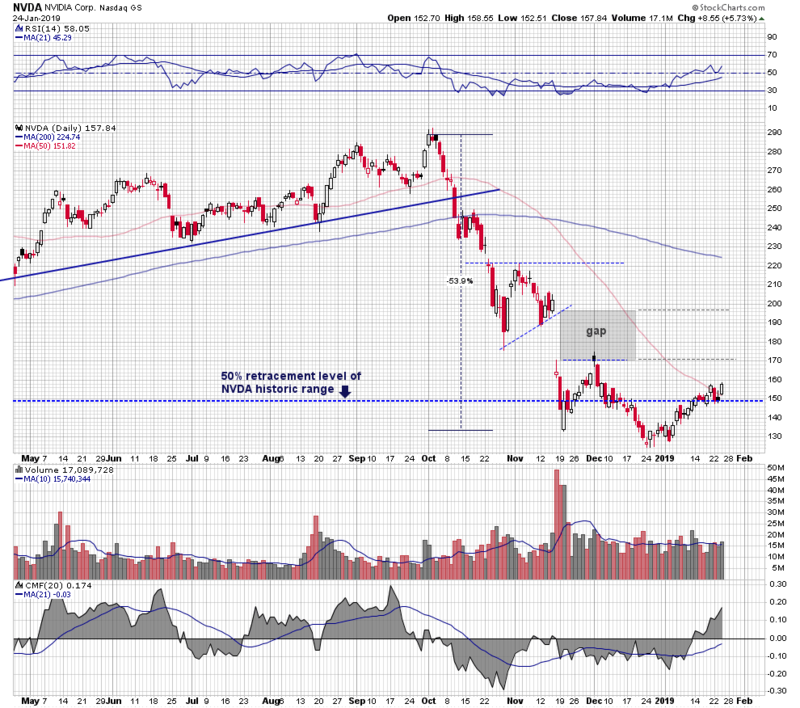 This week it has held that level and moved above its 50 day moving average. Thursday’s close near the high of the session was also a new high for the month and, of course, the year. The relative strength index is tracking higher and has moved above its center line, a reflection of the positive price momentum. Chaikin money flow entered into positive territory two weeks ago, suggesting buying interest. 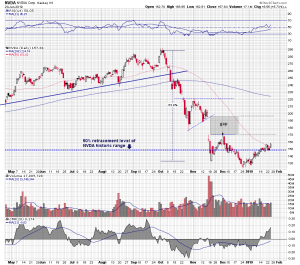 NVIDIA still has a lot of work to do to return to its former bullish trajectory on the chart. But it looks like it may crossed a major reistance level at $150 and now successfully retested it. If it can manage to extend the recent upside move and eventually break through the $170 level, the stock would enter into the unfilled November downside gap zone. The gap is a resistance vacuum and the stock price would be expected to move up quickly to the $200 level.